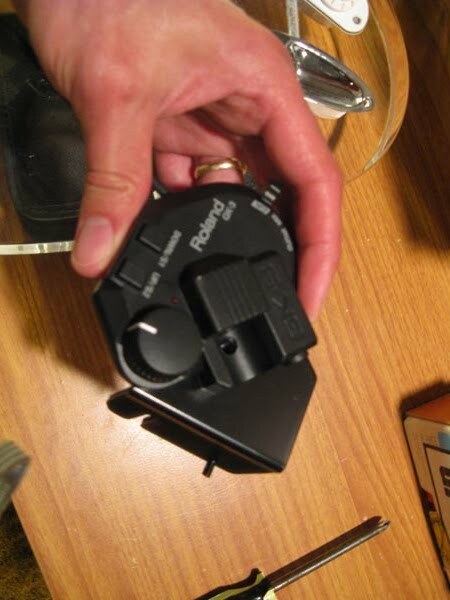 Last night I installed a Roland GK-3 hexaphonic pickup on the space guitar. Why? 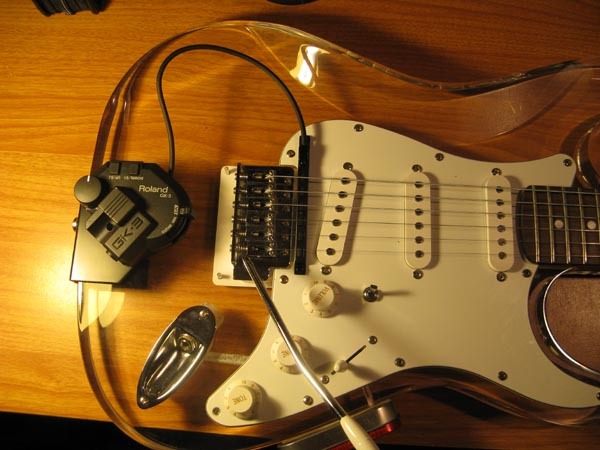 Because once plugged into a guitar synth (a trusty Roland GR-33, no longer made), it will turn the guitar into a MIDI controller. 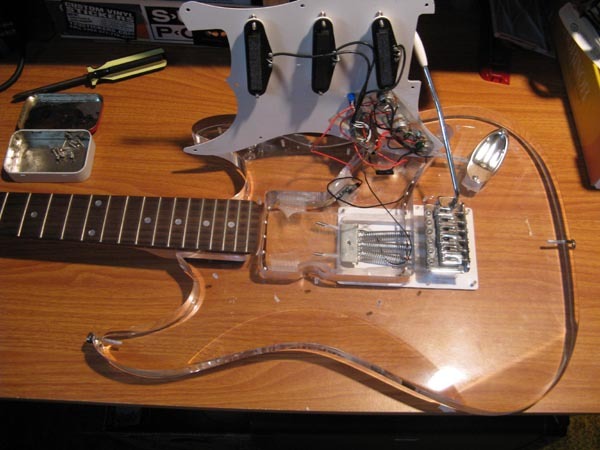 The hex pickup tracks each string separately, and the guitar synth converts the signals to MIDI. The GR-33 itself is a full-featured synth, fully capable of crazy sounds. More on that later. Here's the space guitar before the mod. It's a clear acrylic Strat copy made by "Galveston," a name that belies its Chinese heritage. 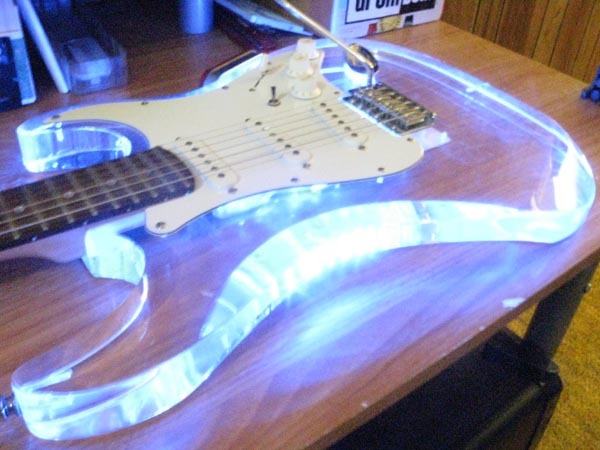 Did I mention it lights up? I installed LEDs inside it as soon as I got it in 2009. 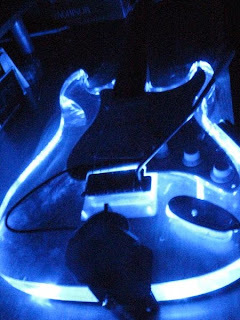 I ask you, what good is a clear acrylic guitar without interior lighting? Why, no good. No good at all. The GK-3 had to go between the bridge and the bridge pickup, so the first step was to check that it would fit. Then I cracked the guitar open to make sure there was something under there that I could drill into. The nice folks at "Galveston" routed out the entire area under the pickguard. That makes it nice for installing nutty pickup combinations (stay tuned for that) but it's not so great if you need to screw something tightly into the body. I removed the strings and the pick guard. As you can see, there was plenty of room to mount the GK-3. I replaced the pickguard and restrung the guitar. Here's where I deviated from the instructions. 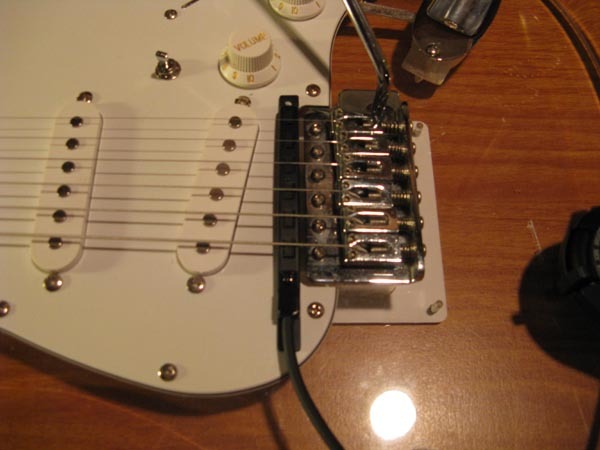 Roland provided two small springs to install between the pickup and the guitar in such a way that the screws go through each spring. That makes it possible to adjust the pickup's height much like the regular Strat pickups: by turning the screws. However, I figured it'd be far, far easier to install the pickup without the screws and achieve the desired height by adjusting the bridge itself. 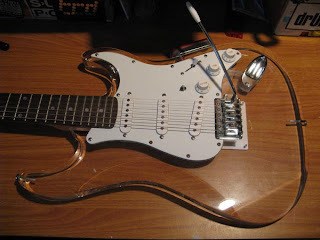 After all, a Strat bridge lets you fine tune the height and intonation of each string independently. Why monkey with the hex pickup too? Sure the overall setup is more flexible with the springs, but that kind of flexibility is like having an extra joint between your wrist and elbow -- not very useful. So I ignored the springs. My chief concern at this point was the hardness of the acrylic and the sheer difficulty of putting screws in it. I knew from past experience, installing strap holders, that the stuff is damned hard. I had even snapped a couple screws in two trying to get them in. Tightness was important for the strap holders -- I didn't want them popping out because I'd surely break a toe when the guitar fell (it's something like 20 lbs.). I wasn't so worried about tightness with the GK-3, so figured it would be all right to drill wider pilot holes. I chose a 3/32" bit, just a mite narrower than the screws. Since the screws were 3/4" long, I drew a red line on my drill bit at 3/4". That way I'd know where to stop. Ingenious, yes. 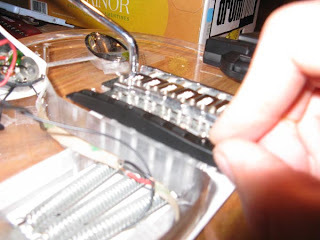 I positioned the GK-3 so that each string passed over some part of its pickup yoke, as instructed in the manual, marked the screw hole locations, and set the pickup aside. Two minutes later the job was done. No broken screws, no difficulty at all. 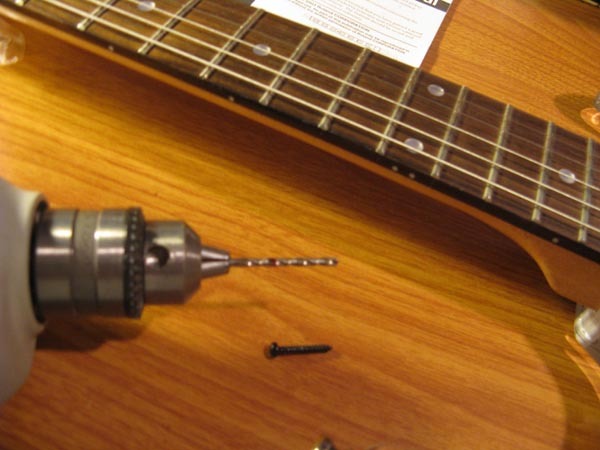 I removed the strap holder screw from the guitar, slid piece "A" over it, and screwed it back in. Then I slid the holder "B" piece over the threaded post sticking out of the first and fastened it all together, nicely sandwiching the guitar between the holders. Installation complete. At this point I did a regular setup, adjusting the height of each string to be the desired 1 mm above the hex pickup when fretted at the highest fret. The result wasn't bad at all. The action was nice and low without buzzing. Then I finally attached the cables to the GR-33 and test drove it. I was impressed with the diversity of its sounds. I chose the discontinued GR-33 over a new GR-20 because the GR-33 is so much more editable. I didn't want to drop top dollar for a GR-20 only to get bored playing trumpet and piano patches. Anyone who knows The Casual Distractions knows that we're all about unrealistic, spacey sounds. The GR-33 has a lot of potential for those. It also has a nice arpeggiator and a send/return loop for regular guitar effects. The GK-3 lets me choose between playing just the guitar, just the GR-33, or a blend of both. The possibilities are amazing. So, that's it. Don't expect to hear this rig on TCD sets until I get the GR-33 sorted out. It may take a couple weeks (it's difficult to fit rig programming in when you're putting in 20-hour days doing open heart surgery down at the ER), but it'll be sometime soon and it'll be wild.